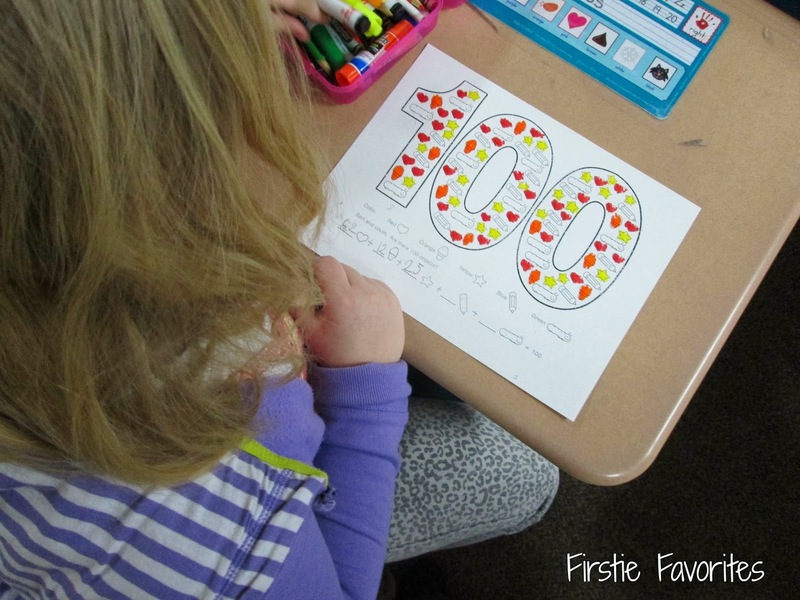 Firstie Favorites: 100th Day! Hooray! Wow! What a fun day... and as usual, I planned WAAAY too much!! We were so busy! 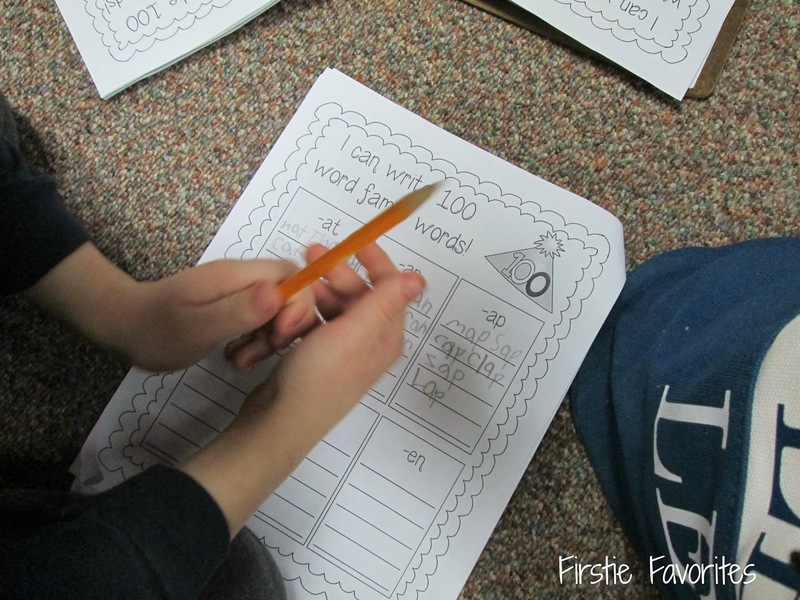 We read 100th Day books, read 100th Day poetry, and did 100th Day math centers and literacy activities. We completed 100 exercises throughout the day and attempted to be silent for 100 seconds on the carpet (that is until we all ended up laughing and giggling... first grade laughter is so contagious!) Here is a look at some of our 100th Day of School Fun!! 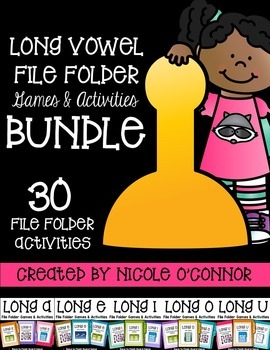 For a copy of our 100th Day packet, visit my TPT store! This is my back table before the day started. 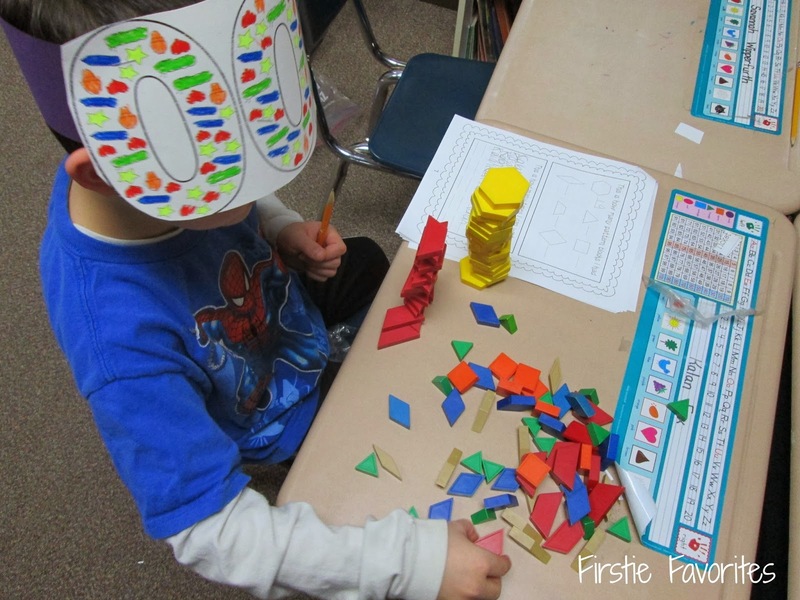 We really did not need very many materials to enjoy our 100th day! We started our day by coloring a picture with 100 little pictures inside it. Students had to color the objects based on a code. 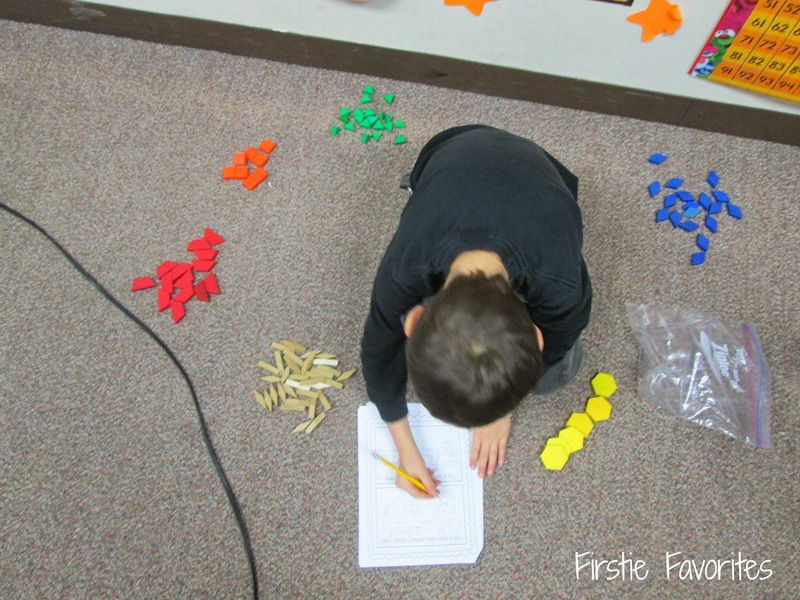 They counted each object and wrote an addition number model that equaled 100. 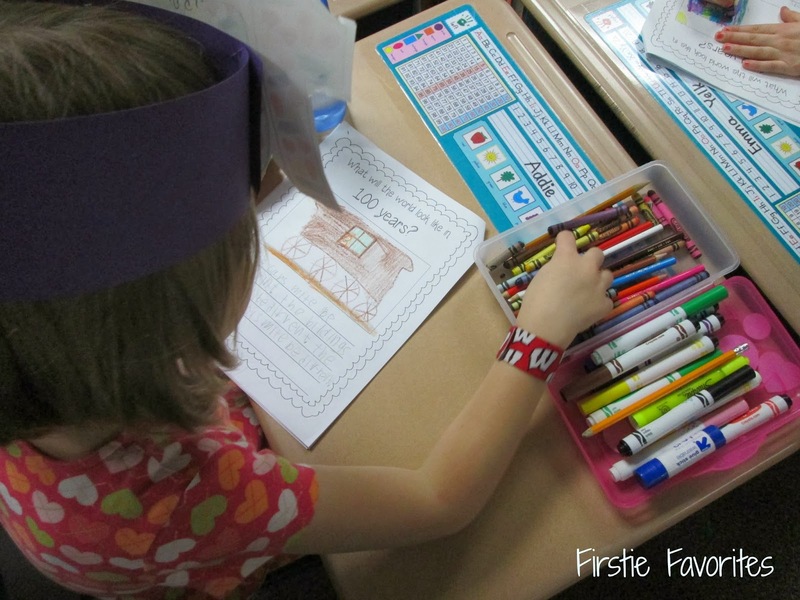 After finishing their counting, we cut out our 100s and made them into a 100s day crown! 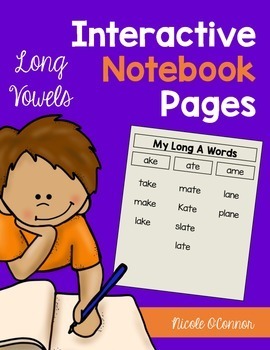 In first grade, we practice word families almost every day. 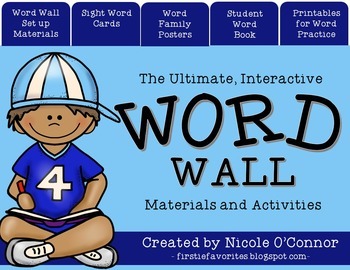 One of the students' challenges today was to write 100 word family words with a partner! I was impressed with how they FLEW through this activity. I guess all of our practice has been paying off! 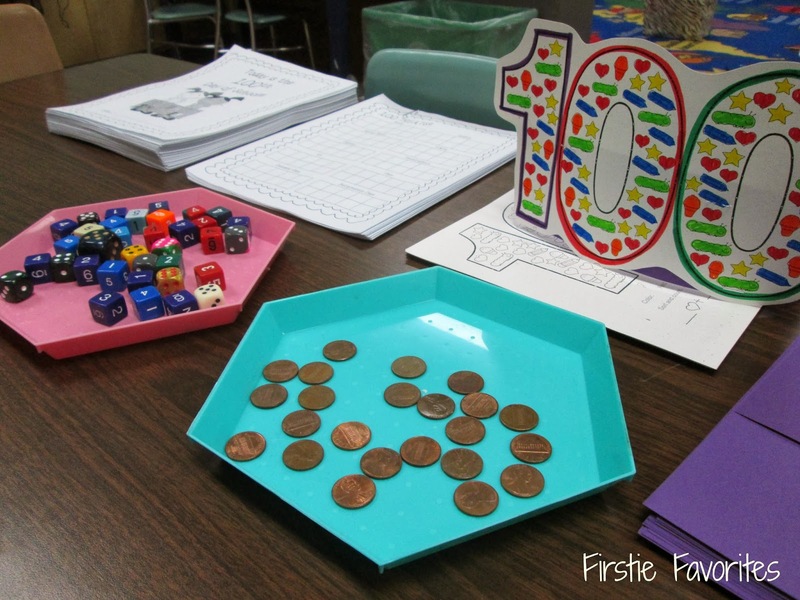 On to math... students completed several math centers all to do with the number, 100. 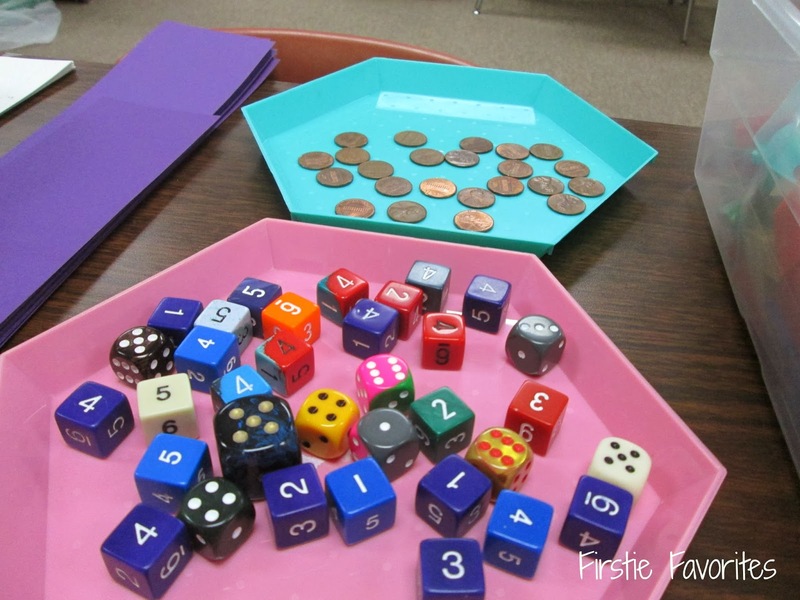 Students rolled a dice 100 times and recorded their results. They flipped a coin 100 times and predicted the outcome. We solved 100 addition problems. We colored a hundreds chart according to a fun set of directions. 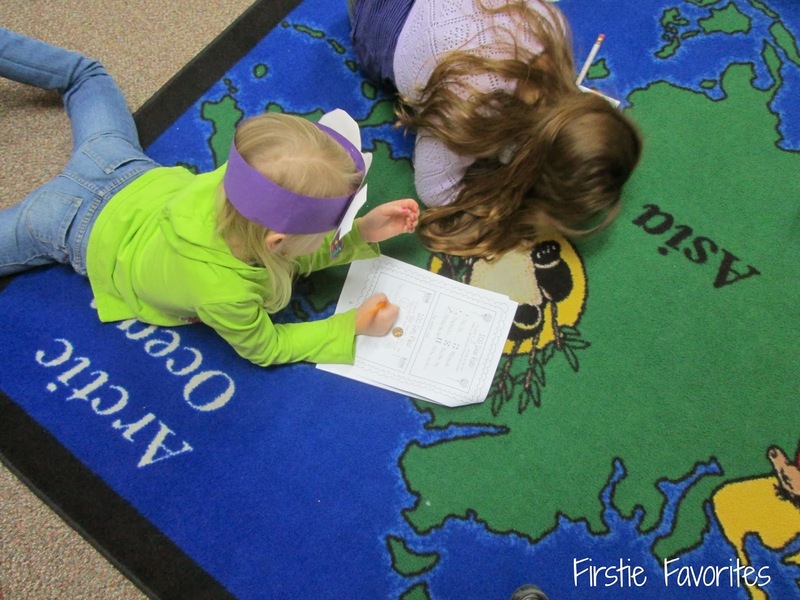 These girls are recording their coin flips! The favorite math center of the day was sorting a bag of 100 pattern blocks and counting how many of each block were in the bag. This afternoon, students wrote about what they thought the world would be like 100 years from now. They seemed to really think that people would be living in houses made out of ice (which makes sense since we have had 4 days off of school this winter due to below zero temperatures.....) HA! 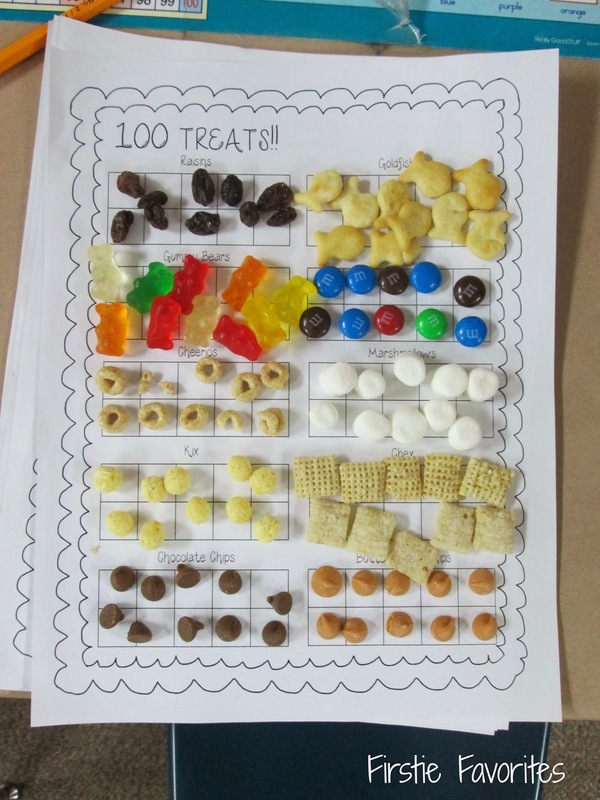 And finally, our special 100th Day snack with 100 TREATS! 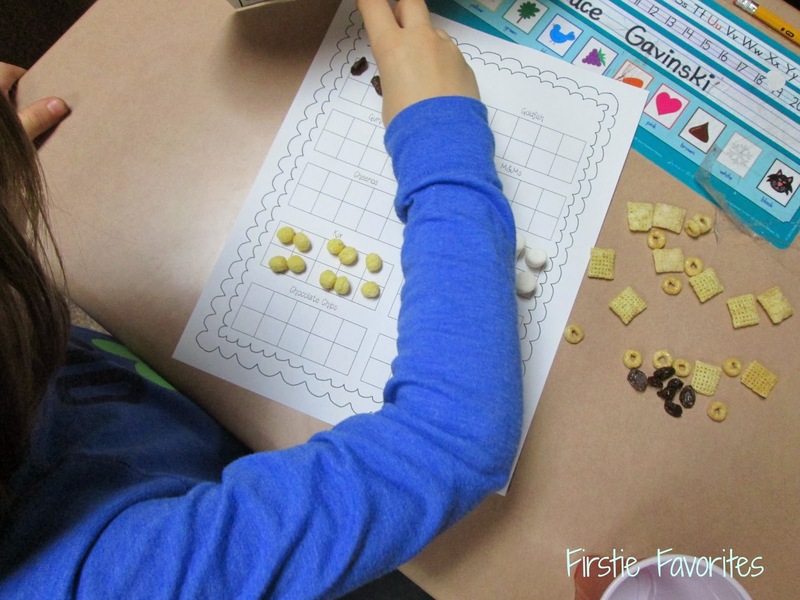 Students got 10 of the following treats to organize in 10s frames. Raisins, Gummy Bears, Cheerios, Kix, Chocolate Chips, Goldfish, M&Ms, Mini Marshmellows, Chex, and Butterscotch!!! YUM! 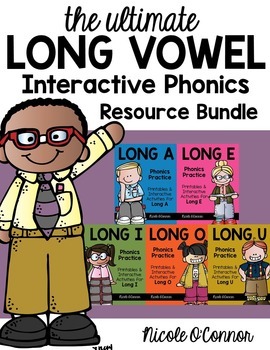 Long Vowel Interactive Phonics Resource Bundle! 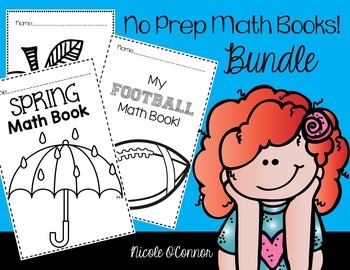 No Prep Math Book Bundle!! Chunk It Up! 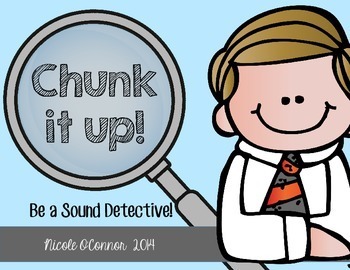 Be a Sound Detective! 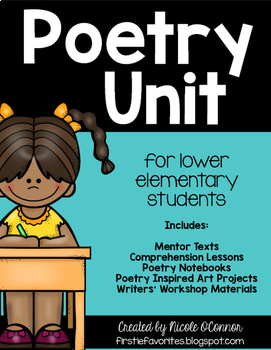 The Ultimate Poetry Writing Unit! TGIF! 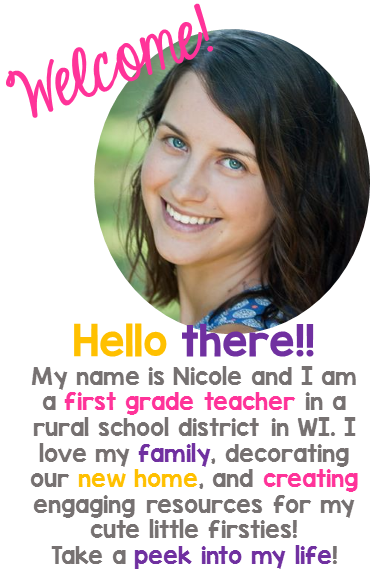 - Thank God It's First Grade! Five for Friday: A Long Week! Lovin' the Weekend and Dr. Seuss! My First "Five for Friday"
All About Books: ROUND ONE! 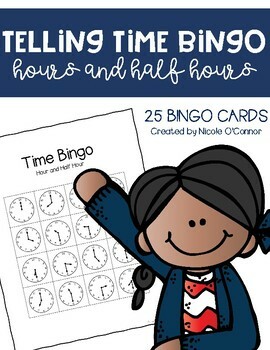 Gearing up for the 100th Day! Hooray! 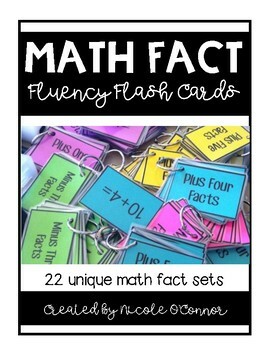 Advanced Math Boxes: Chapter 6 is here! 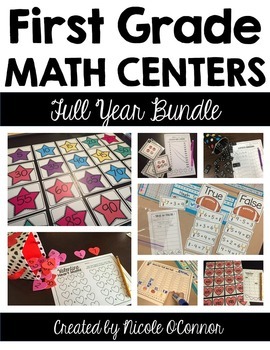 A Quick Post about Math! A Few Things I'm Loving Right Now!